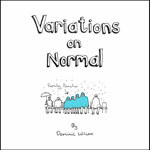 My book of invention drawings ‘Variations on Normal’ is out now, you can buy it here. Click the image to view the full post with the comments people have made. How’d you came with all these things? They are amazingly crazy, but extremely great. this is great! I can’t stop coming here for mind of ease at work (while also designing stuff for the world)! Please keep it up, this is great! We should make a podium with wheels and walk you around showing you off because you are Great ! darlin, your mind is as warped as mine…keep on keepin on. These gave me a good chuckle. I could use those eyes-open magnets on a daily basis. I so need a Name GPS and would so give a lot of ppl I know that Handshake training device! Oh my God! Now, I know the reason why this blog is nominated to webby! I check all the drawings and it makes me laugh..I never knew that there were blog like this..very very very funny! I will subscribe to you and will nominate you on webby! Good luck to you!!! Thank you from the both of me. Guess what? You just got slashdotted. Prepare for your genius ideas to become a lot more popular. your ideas are crazy, funny yet seemingly workable all at once!! Simply delightful!! Hi Dominic! I went to kk last week and watch the video, it was very good. We r using ur work as a starting point in a subject about, what makes jo smile. I must say u make it look easy, as I have gave myself a headache trying to think of ideas. Thanx 4 letting us see ur work.